Are you looking for a Leave Application Form to submit for yourself to take a leave from your company or needing a leave of absence form for your employee who needs it? Download this Leave Application Form template now! If an employee is unable to perform his duties for a stipulated period of time, he or she is supposed to write a leave application for the same. For example, if a woman needs maternity leave she writes a leave request letter or a makes sure this letter is written for her other employees. A Leave Application Letter can also be written by employees who want a short or long-term leave for other reasons. The process of writing a leave application letter starts by the employee writing the letter from scratch or by filling in a standard form used by the company. Through this letter, he is informing the concerned person/manager the reason of his or her absence in an official way. This process is considered to be the most professional one in a corporate culture. You can make sure the concerned person/manager gets the letter by post but you can also send it by email. Just make sure you do it one time and not last minute. This Leave Application Template can be used by you or your HR department to quickly standardize the leave application workflow or to quickly write your own letter. After downloading, you can customize every detail and the complete appearance of your document and finish in minutes. Using our Templates guarantees you will save time, cost and efforts! The template can be printed or added to the intranet HR workflow. Download this Leave Application Form template now! 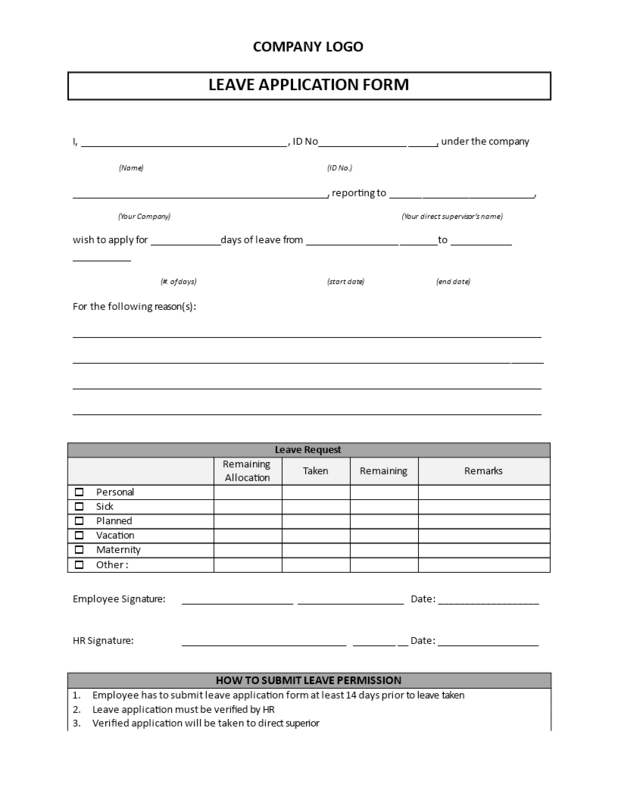 Click here for more leave application form templates.